Sacrifices, rewards and a desire to simply “tell them thanks” are the inspiration for The Cowan Family Fund at Hamilton Community Foundation. 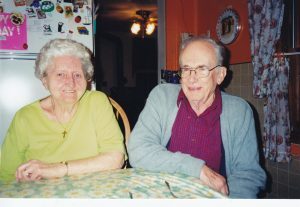 The bursary fund honours Bob and Irene Cowan, reflecting their gratitude for the support they received as seniors: from the care Irene has needed in later years, to the assistance that enabled Bob to live at home to age 93. They realized the special skills required by those working with seniors, so this fund will support McMaster University students with an emphasis on those studying gerontology. Irene and Bob met during the Second World War, and she sacrificed much to join him in Canada. Bob came from a large farming family, and commitments meant sacrificing formal education. Still, he pursued self-education while working as a stationary engineer and following his dream to farm. Irene, meantime, encouraged an entrepreneurial spirit in their five children, helping them grow and sell vegetables to earn money for “extras.” Married for 65 years, they stubbornly held onto their farm through good times and bad. Ultimately, it was the sale of the land that made The Cowan Family Fund possible.